Drawing inspiration from the passion of the "worst director of all time," Tim Burton has fashioned an entertaining biography of Ed Wood that evokes love of film better than anything since The Purple Rose of Cairo. Wood gained his title by his unintentionally hilarious films of the '50s like Glen or Glenda?, which chronicled his own secret transvestism, and Plan 9 From Outer Space, the ultimate bad movie about an alien plot. Burton, working from the script by Scott Alexander and Larry Karaszewski, embraces Wood's earnestness and treats his story with the same respect. While the laughs are nearly nonstop, they never come at the expense of Wood or his adopted family of eccentrics. Johnny Depp stars as Wood. He disappears completely into the director's optimistic persona. 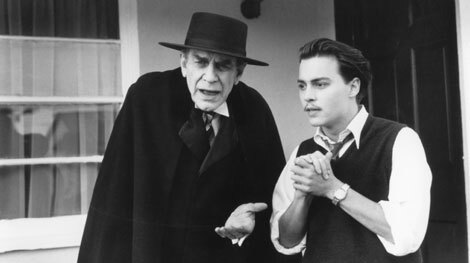 Depp's infectious spirit energizes the whole film, even lending it legitimate pathos in Wood's relationship with the aging, morphine addicted Bela Lugosi. Martin Landau doesn't just play Lugosi, he becomes Lugosi, thanks partly to Rick Baker's amazing makeup but mostly to Landau's consummate skill. He's funny and crude, pathetic and inspiring. Landau deserves this year's Oscar for best supporting actor. There is also nice work by Sarah Jessica Parker as Wood's girlfriend as well as by Bill Murray, Jeffrey Jones and, in a late scene that sums up its ideas perfectly, Vincent D'Onofrio. The essence of Ed Wood is the artistic impulse in everyone and though it's uncertain what guides Wood's passion for filmmaking, it's obvious that it's there and that maybe it should be enough. If only his films weren't so awful. Burton pays homage to Wood's style of filmmaking by making his own film in glorious black and white cinematography by Stefan Czapsky. The technical credits, including Howard Shore's bouncy score, all hit their marks without being too showy. Ed Wood succeeds as well as it does because it never looks down upon Wood and the people around him. It would be easy to sneer at the sheer badness of the movies Wood made, but this approach is smarter and, in the end, more satisfying. Despite being a tad overlong, Ed Wood is one of the best films of the year. Ed Wood could have turned out to be a sad story. As the end credits inform the audience that Wood became an alcoholic and died at 53, Depp's beaming image smiles. They seem incongruous, but the film has exemplified the inexorable link between happiness and tragedy in the artistic process. It finds brilliance in the depths of mediocrity and should touch the heart and mind of any film lover. I think that this is Burton's finest moment and next to EDWARD SCISSORHANDS, his most personal film. I have a feeling that he took the commercial failure of ED WOOD quite hard and IMO hasn't done anything nearly as good since.